S ome workboat operators defend themselves against higher diesel prices by buying futures contracts, while others purchase fuel at prices fi xed in advance from their suppliers. Others, perhaps less-savvy and/or smaller companies, however, take their chances by buying in the spot market. While some operators are uncertain about their future fuel requirements and consumption, domes- tic ferry operators for the most part know exactly what they’ll need in the year ahead. 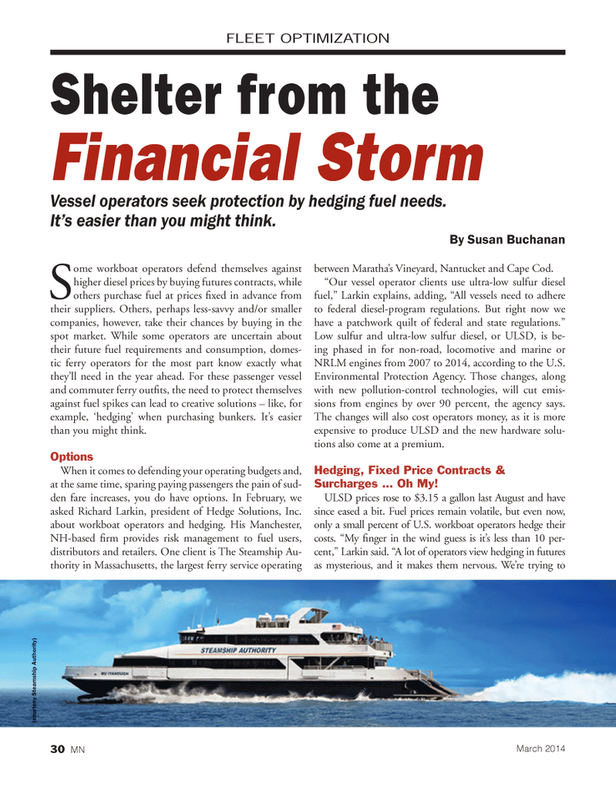 For these passenger vessel and commuter ferry outfi ts, the need to protect themselves against fuel spikes can lead to creative solutions – like, for example, ‘hedging’ when purchasing bunkers. It’s easier than you might think. NRLM engines from 2007 to 2014, according to the U.S.
Environmental Protection Agency. Those changes, along with new pollution-control technologies, will cut emis- sions from engines by over 90 percent, the agency says. The changes will also cost operators money, as it is more expensive to produce ULSD and the new hardware solu- tions also come at a premium. Vessel operators seek protection by hedging fuel needs.